Ferdowsi mentions the exact date for his sixty-third birthday in the Shahnameh. After reconciling the calendar he used with the ones still in use today, it’s been determined that he was born on Friday January 3rd, 940 A.D. (329 A.H., lunar calendar). His birthplace, Bazh, was a village in the neighborhood of Tabaran, the main district of the old city of Tus, in the province of Khorasan, Iran. His honorific title (konye) is unanimously recorded as Abu’l Qassem, which indicates that he had a son named Qassem. His son’s death at a young age grieved the poet immensely. According to Nezami-Aruzi, Ferdowsi left behind only a daughter – a high-spirited lady. But there seems to be no trace of her in the poet’s work. Ferdowsi’s first name and that of his father are given variously. The most reliable version is Mansur son of Hasan, recorded by al-Bondari of Isfahan. We know no other forebear of Ferdowsi, and he himself makes no direct mention of his family history. A well-known fact, however, that he came from a dehqan (a noble landowner) family, throws light on his background, and on his monumental undertaking, the Shahnameh. For Centuries after the fall of the Sasanian (the last Iranian dynasty overthrown in the Arab invasion of the seventh century A.D.), the dehqans remained pillars of the Iranian community. They endeavored to preserve the memories of the golden days of the perished empire. They upheld the heroic traditions and the cultural heritage of Iran. Consequently, they became the paragons of the Iranian people. The very term dehqan became synonymous with “Iranian”, and the “learned narrator of history and sagas” of Iran. Ferdowsi came from this class, the landed nobility. Although his early years are obscure, being the son of a well-to-do squire, he undoubtedly received a high education and a strenuous physical training. The type of education and training which the sons of Iranian nobility would traditionally undergo. It is evident from his masterly creation, the Shahnameh, that his educational concentration was on the Persian literature, and the Iranian history & sagas. He learned a great deal about ancient Iran and its heroes, culture, and heritage. In 360/970, Ferdowsi, then thirty years old, was an accomplished poet, married, with a two-year old son. He had a number of celebrated friends; among whom Mansur, the son of Abu Mansur Mohammad Abd-al-Razzaq, occupied a special position. Ferdowsi’s life was filled with efforts to learn incessantly and attending the learned gatherings. He had a profound appreciation for beauty, especially natural beauty. This combined with his astonishing imagination made him an artist whose descriptions of the scenes are as colorful, as lively, and as absorbing as the great work of a master painter of the Realism School. Ferdowsi was a tall figure with a lively and optimistic nature. He lived much in the same way, as did his Sasanian ancestors, with prosperity and joy. He enjoyed such pastimes as horseback riding, playing games, feasting and drinking wine, and listening to music and songs. He loved life and all it had to offer. He was courteous, kindhearted, truthful, open-handed, warm, and faithful. He despised prejudice, ignorance, and greed. 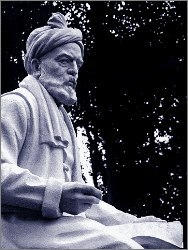 Ferdowsi’s personality is well reflected in his work. He admired wisdom sincerely. For Ferdowsi, “truth” and “wisdom” were the keys to salvation. He emphasized that in moments of defeat and decline, hope must be retained; because old fallen trees can grow anew if their roots are preserved. This is one reason why he wanted to preserve the memories of Iran’s glorious past – which someday it might rise again. It was as if his love for Iran was part of his religion and governed his way of thinking. He idolized Iranian heroes, glorified their ways of life, and defended their traditions with zeal and conviction. Ferdowsi spent his best years pouring his energy and heart into charming, meaningful, and exciting poetry. The Shahnameh is an impressive monument of poetry and historiography; a poetical recast of what Ferdowsi and his predecessors regarded as the account of Iran’s history. The singular message that the Shahnameh strives to convey is the idea that the history of Iranshahr was a complete and immutable whole. It started with Gayumarth, the first man, and ended with his fiftieth scion and successor, Yazdegerd III: six thousand years of history. The task of Ferdowsi was to prevent this history from losing its connection with the future Iranian generations. Needless to say, he succeeded in a way that no other historian has, either before or after him. As a man of strong principles, Ferdowsi kept the Shahnameh undedicated for a long time. In all the years he was composing the Shahnameh, he had saved it for a royal patron who would recognize the value of such a treasure and would be worthy of receiving it. Such patron would ensure preservation of copies of the Shahnameh, and would help to propagate them throughout Iran. In the eyes of many Iranians, including Ferdowsi, Soltan Mahmud, the Ghaznavid, had created a burning hope for an Iranian renaissance. For the first time since the Arab invasion, an Iranian dynast, speaking Persian and following all Iranian traditions, had unified the whole of Iran and appeared to be heading for the revival of the Sasanian culture and empire. The Divan system was being kept in Persian instead of Arabic; a nationalistic move that only Mahmud’s sanction could have made possible. With his mighty armies, lofty palaces, valuable treasures, hosts of musicians, singers, and poets, his “eagle banner”, his elephants and park games, his banquets with wine, and his celebration of Noruz, Mehrgan, and Sadeh, for the first time since the fall of the Sasanian, their magnificence and splendor had been revived in the court of Soltan Mahmud. In order to emphasize his “Sasanian origin”, Mahmud had gone so far as to publish a fictitious pedigree tracing his descent to Yazdegerd III. Ferdowsi regarded Mahmud as a new Freidun, a just, brilliant, worthy and legitimate Iranian King. He finally presents his Shahnameh to Soltan Mahmud, a sovereign whom he viewed as deserving of such a treasure. This occurred in 395/1004, when Ferdowsi was sixty-five years old, and exactly twenty-five years after he had begun to compose these stories in verse. The popular myths about Ferdowsi agreeing to compose the Shahnameh in return for sixty thousand gold coins (Dinars) from Soltan Mahmud, as well as his visit to Mahmud’s court and defeating the court poets in a poetic contest are all false. By the time Mahmud came to power in Khorasan, Ferdowsi had been working on the Shahnameh for nineteen years. Furthermore, he never met Mahmud. As it happened, Mahmud did not appreciate the Shahnameh, nor did he realize the honor that its dedication had bestowed upon him. Many reasons have been given for Mahmud’s cool reception. First and foremost, Ferdowsi never presented the Shahnameh in person. As a result, the Shahnameh was deprived of a traditional and highly effective “ceremony of presentation to the royal patron” by the author himself. Unattended, his work had little chance of fair introduction and, therefore, little chance of fair attention. Secondly, unfamiliar with Mahmud and his pretentious and lordly nature, Ferdowsi employed a bold and advisory tone in his panegyrizing passages. He called the king’s attention to the achievements and nobility of Iranian heroes in the Shahnameh. Undoubtedly, Mahmud took such remarks too personally and as an affront to his own majesty; he therefore received Ferdowsi’s work with no enthusiasm. Furthermore, Ferdowsi had praised Mahmud’s grand vizier, Fazl ebn-e Ahmad-e Asfarayeni, a bold counselor imposed upon him by his father, Sebuk-Tegin, while Mahmud was the Sepahsalar of Khorasan. Asfarayeni frequently questioned Mahmud’s Judgments and threatened him with resignation. By the time Ferdowsi sent the second edition of the Shahnameh to Mahmud’s court, in 395/1005, almost certainly through the grace of Asfarayeni, the king had made up his mind to remove this powerful and headstrong minister. Ferdowsi’s warm and impressive praises of Asfarayeni and his statesmanship most certainly further alienated Mahmud. Thirdly, political developments had in the meantime shifted Mahmud’s interests and had changed his personal behavior. While rising to power, he posed as an Iranian king wishing to revive the Sasanian state. Having achieved his aim in becoming the most powerful sovereign of his time, he no longer deemed it necessary to rely on ethnic or national loyalties. Instead, Mahmud decided to play the role of an Islamic hero crusading for the spread of the faith. This way, he could rely on mass support throughout the Islamic Asia, and especially from Baghdad. He was being hailed as the restorer of the traditional Islamic beliefs. Obviously, Iranian nationalistic tendencies ran contrary to his new pro-Arab policies. As the symbol of Iranian heroes and veneration of Iranian traditions, Ferdowsi had gone so far as to condemn the Arab conquest of Iran. To champion such a book as the Shahnameh meant weakening his Islamic support, and this, Mahmud was not prepared to do. Two other factors contributed to the cool reception of the second edition in 396/1005. One was the envy of Mahmud’s court poets, who depicted their king as greater, wiser, braver, and more splendid than the most illustrious Shahnameh heroes, while condemning Iranian sagas as “baseless tales”. The flatterers attended the king constantly, and had ample opportunity to belittle the value of the Shahnameh. The second factor was Mahmud’s constant occupation with state affairs, preparing and carrying out military expeditions and time consuming feasts, and ceremonial occasions, which all combined to leave him little time or enthusiasm to read or listen to long stories of ancient Iranian kings and heroes. How much of this was known to Ferdowsi, it is not clear. He often wondered over the lack of response from the royal court. Yet he continued to perfect his work and supplement his stories. Occasionally, he inserted a few lines panegyrizing, at the same time criticizing, the king and hinting at his own condition. Finally, in 400/1009-10, the third and principal version of the Shahnameh was completed. As a grand and continuous history of the Iranian nation, it was sent to Ghazne with definite dedication to Soltan Mahmud. It contained nearly sixty thousand distiches of imposing epic and lyrical nature and was the result of thirty long years of hard work by the greatest Iranian poet. Seventy-one years of age, weak, lonely and distressed, Ferdowsi expected a handsome reward from a king whom he once viewed as a second Freidun, a reward that never came. The popular sentiments toward Ferdowsi exacted a terrible “revenge” from Soltan Mahmud by fabricating a biting satire on him. As it stands, the Satire is a truly fascinating literary creation. It contains a fair number of genuine verses taken from Ferdowsi’s statements on occasions with no relevance to himself or to his relation with Mahmud. They are skillfully joined together to supposedly convey Ferdowsi’s judgment on a pact-breaking king. No reader could remain unimpressed. It succeeds in presenting Soltan Mahmud as a ruler of lowly origin who was envious of the glorious descent and deeds of the ancient heroes and kings. It depicted him as vengeful, greedy, and incapable of appreciating poetry and fine skills. Above all, the Satire explains Mahmud’s lack of appreciation of the Shahnameh as due to his fanatical anti-Shiism. However impressive, the Satire is a forgery. Ferdowsi did indeed show his disapproval of Mahmud’s excesses and fanaticism. He, however, did so very politely and indirectly, in the form of advice and warnings often inserted in the passages panegyrizing the king. Although one can see clear traces of Ferdowsi’s complete disappointments, there is nothing in his work to suggest that he actually denounced Soltan Mahmud. As reported by Nezami-Aruzi and echoed in the Shahnameh, Ferdowsi was a wealthy landowner with a considerable estate when he began composing the Shahnameh. He lived comfortably for sixty years. At that point, his occupation with the Shahnameh and, as a result, lack of attention to his land forced him to sell most of his property. All that remained was an orchard wherein he was later buried. When nearing sixty, he laments over the time when he was a rosy-cheeked young man with thick black hair, proud of his horsemanship and other outdoor sports, enjoying a comfortable life and a skill for composing poetry. By the age of sixty-five, in 395/1005, he is completely white haired. He has become deaf, shortsighted, empty-handed, and exhausted. To top things off, a disaster strikes. His only son dies at age thirty-seven. Ferdowsi’s mourning over his son is one of the most personal and moving pieces of the Shahnameh. In 411/1019-1020, after long years of ill health and poverty, Ferdowsi died at the age of eighty-one. Some Moslem fanatic prevented his burial in the Moslem cemetery of Tus, reasoning that he had devoted his life to the elevation and immortalization of ancient Iranians, and was therefore not a true Moslem. He was buried in his garden located inside the town of Tabaran near Razan Gate, a few miles northeast of the present day Tus and a short distance from the village of Bazh, where he was born. It was said that Arslan Jazeb built a domed mausoleum upon Ferdowsi’s tomb. At one point, Ferdowsi’s mausoleum was destroyed to supply construction material for rebuilding the citadel of Tus. It was restored under the just king, Ghazan Khan. 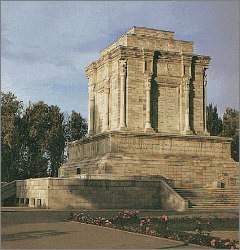 However, soon after his death, Ferdowsi’s tomb became a national and religious shrine. Dowlatshah testifies that it was a place of pilgrimage in 892/1487. A century later, Shushtari wrote: “in spite of the ruin of Tus generally and the destruction of the building by the order of Obayd-Allah Khan the Uzbek, his [Ferdowsi’s] shrine is nowadays defined and known; people from all realms, particularly the Emami Shiite, make pilgrimages to it. The present writer [Shushtari] has also had the honor of visiting it”. With the rise of the Qajar's, the tomb was neglected. In 1236/1822 only a little domed building had remained. In 1858, even that had vanished. Local peasants reported that Ferdowsi’s tombstone had been removed and reused in the walls of a public bath. Toward the end of the last century, Asaf-al-Dowleh, then governor of Khorasan, cleared the mound around the site of the tomb and built a brick structure over it. A generation later, at the behest of nationalists, led by M. T. Bahar and Arbab Kaykhosrow Shahrokh, the Iranian government investigated the tomb and confirmed its attribution to Ferdowsi. A new mausoleum was built on it and a new marble tombstone placed therein.